Super Bowl #49 is history. Soon we’ll have March Madness, and then baseball season. We can easily interpret our own lives as a game, hopefully well-done. Right now, it’s half-time, or a 7th-inning stretch, so to speak. What are we going to do differently to win the game of life—eternal life? 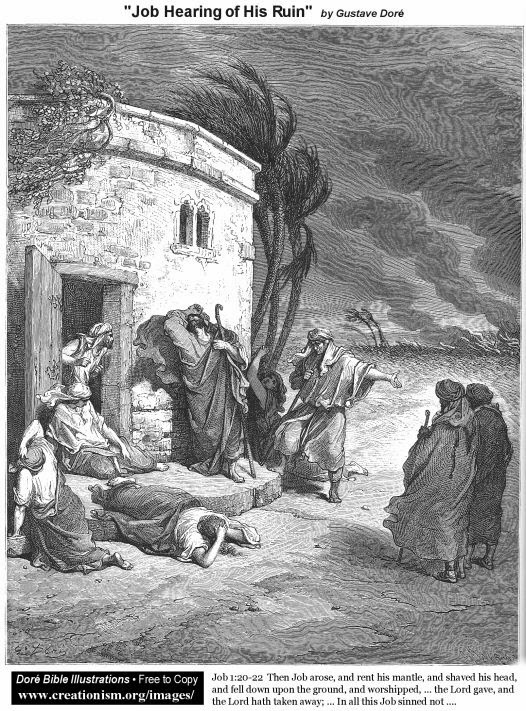 Dore's "Job Hearing of His Ruin"
Biblical scholars describe the Book of Job as a poetic drama dealing with the problem of evil and yet offering no easy answers. As the legend begins, Job has everything he could possibly want. But gradually he loses everything he has. Job asks: How could this happen to me? But the better question might have been, how will I respond to these misfortunes? How will I deal with them? And then God speaks to Job in a whirlwind. Job in so many words cries out: I don’t understand. And God says: That’s right, Job, you don’t understand. God doesn’t answer the questions; he simply lets Job experience God’s awesome presence in some mystical way. Our faith in Jesus proclaims loudly that suffering and death are not the final reality; healing and new life and resurrection are. And in the meantime Jesus challenges us to fight against evil and suffering, to heal, console, forgive and create compassionate communities. The question is: what energizes us? Where do we find meaning or purpose? In our family? Work? Volunteer service? Experiences? Nature? Probably all of these. Eventually we have to find meaning in the mystery of our own dying, where we will have to let go of our earthly life and make a leap of faith into the hands of God forever. In the Gospel, Jesus continues his purpose-driven life to proclaim that human beings have a destiny. The Risen Christ, by virtue of the waters of baptism, empowers us to choose our better selves. Every one of us has gifts or talents. We possess the power to believe, to hope, and to love. There are many splendid callings. Father or mother, teacher or student, doctor or lawyer, business person -- whoever you are, you have a specific vocation, a calling, right now, to empower people to choose their better selves, by simply being an example. The Spirit of God illumines our minds to know the way we should behave, and strengthens us to behave in that way despite obstacles. He gives us his gifts: "love, joy, peace, patience, goodness, faithfulness, gentleness and discipline." These gifts or talents we have are for the common good, for the family in which we live, for the profession in which we work, for the team, for the community. The Spirit empowers us, as we are, to help others become more human and more godlike in relationships. May we all realize that the purpose of life is to matter, to make a difference for the better, by giving the best we have. Go team!